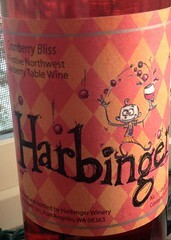 I pulled into Harbinger Winery in Port Angeles, WA after a morning of cider deliveries for Finnriver. 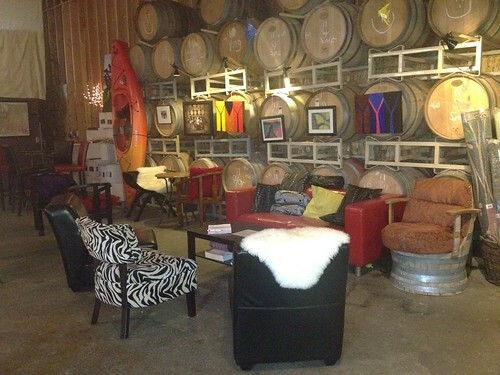 Immediately, I was struck by the tasting room atmosphere, which reminded me of a cool rec room. Mismatched seating, a kayak, paintings, and random esoterica? Check. 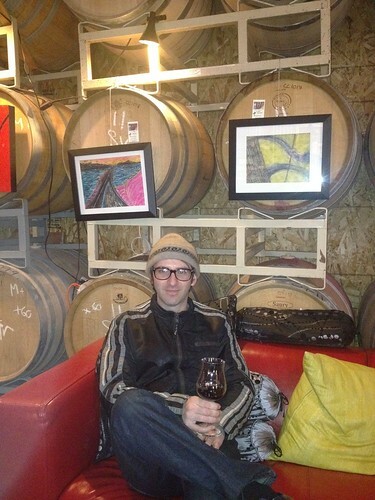 And how many wineries have you been to in a converted logging truck shop? This wine is the embodiment of what I admire about Washington wine; the kind of WTF spirit to put together an eccentric blend. The wine itself is sweet-tart. Actually more towards the tart side, where the naturally puckering cranberry does its best to mask the sugar. (It’s actually a lot dryer than I expected.) With my penchant for hyper-acidic wines, I could have taken a little more tartness. And I regret not having a turkey sandwich or some cold fried chicken on hand; this is a total poultry wine. Or a nice foil for spicy foods. Maybe even a pulled pork sandwich. 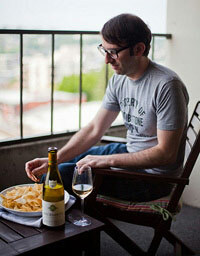 So next time you’re in Port Angeles, stop by and say hello to Dave. Or Sara, the owner and winemaker, might be pouring you a taste. And if you turn around, I’ll be relaxing on the sofa. Let me know if you need any other recommendations. Hope you can make it to Finnriver, naturally! Awesome post and pics. I bought a cranberry wine from a place in Canada and have yet to try it. I need to open it soon! Thank you! It’s like drinking Thanksgiving. I’ll make sure you get a bottle and well have it with some turkey sandwiches. Appreciate you reading and commenting.